The man who created a line of compact motorgraders didn’t get to see the company return to his family’s ownership. Bud Lee, who first built the smaller machines (and the company that would become Champion Motor Graders) to suit his own needs as a contractor, passed away five years ago, while the company was still owned by Volvo Construction Equipment. Volvo executives decided last summer to divest the Champion line and sold it back to Lee’s family. As a paving and grading contractor, Lee needed a smaller motorgrader unlike any in the market. So in 1980, “He just built his own. That’s just the way he grew up. They had to build everything they needed, ” Bryan said. While working with his new machine, a colleague expressed interest in owning one of his own, so Lee built a second motorgrader to sell. From then on, the company experienced a gradual climb in success. By 1992, the company was building 30 units a year. In 1993, Bryan said his family was approached by Champion Road Machinery based in Goderich, Ontario, Canada, the company that built the first hydraulic motorgrader. “Champion was really the pioneer of it, ” he said. Lee decided to sell because, “we had carried the product as far as we could, ” Bryan said. With a worldwide market firmly in place, the family sold its company to Champion. Lee retired following the transaction, but his son-in-law, Gary Abernathy (Bryan’s father), remained with the new company as general manager. “He was the point man here and he reported back to Goderich, ” Bryan said. Champion allowed the family to run the company the way they always had. And when Volvo purchased Champion in 1997, the arrangement continued. Still, Gary seemed to know deep inside it was a temporary situation. “It’s like he spent every day working for them but also knowing that the company would come back, ” Bryan said. As time went on, Bryan said Volvo executives found the Abernathys’ niche market harder to understand. “Most of our customers are the mom and pop operations, ” he said. At first, the Abernathys spent a year trying to change Volvo’s mind about selling them off, but the decision became final in June 2004. Through Champion and Volvo, the Abernathy family maintained a gentlemen’s agreement with their owner that they would have the first right to purchase the company in light of a sell-off. Gary equated the experience to graduate school. “Not every small equipment company gets a chance like that. That door opened for us, now it’s up to us to make the most of it, ” Gary said. Bryan has been delighted by the loyalty of their dealers throughout the country and the world. They sell to approximately 30 dealers with 350 branches in all 50 states, Canada and New Zealand. The compact motorgraders, which average 15, 000 lbs. (6, 800 kg) (approximately half the weight of the normal-sized machines), are beneficial in confined areas such as parking lots and driveways, as well as indoor projects. “We have always believed that a grader operator should feel at home at the controls, no matter what the size of the machine, ” Bryan said. Even the presence of a brake pedal is important. “You wouldn’t think this is a big deal – it’s just a brake pedal. But you won’t see one on most small graders. People seem to thing we don’t need a service brake with a hydrostatic drive. I think they’re wrong, but I don’t want to wait until someone gets hurt to prove it, ” Bryan said. Just before the Abernathy family purchased the business from Volvo, the facility earned its registration for ISO 9000:2004 quality assurance. “It’s one thing to go into a machine shop and just build yourself a grader. It’s another to properly document every step of the process to make sure you build every machine the same way; to make sure all your drawings are always accurate and up-to-date; to make sure you inspect and record every checkpoint every time, from the design stages to delivery of the finished unit. All that making sure is what makes you an ISO facility, ” Bryan said. 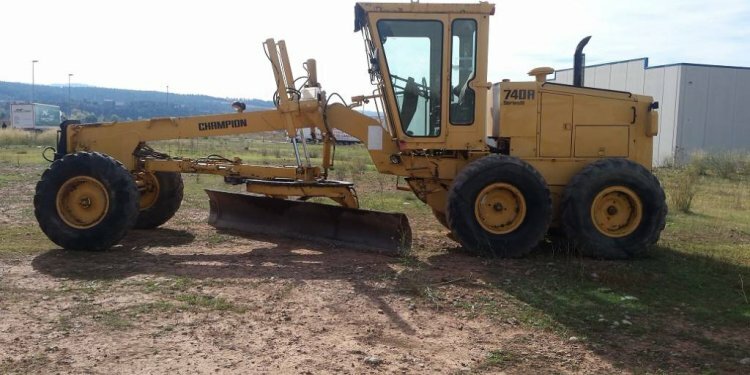 Champion also produces attachments, including front dozer blades, rear rippers, front end loaders, and have mounted after market attachments such as asphalt profilers and vibratory compaction drums and plates. While Champion has signed a five-year non-compete agreement with Volvo to not produce a full-sized motorgrader, Bryan said they hope to begin designing something in the 24, 000 lb. (10, 800 KG), 130 hp (175 kW) range. Champion now employs 25 people in the office and manufacturing department. Jeff McKee, vice president of engineering and customer support, leads their staff, which includes four engineers.